Over the last few weeks, we made it easier to find more kinds of information in Gmail as well as use multiple Gmail accounts at once. Google Docs and Google Sites both added new features, and we released improved tools to move existing data to Google Apps. 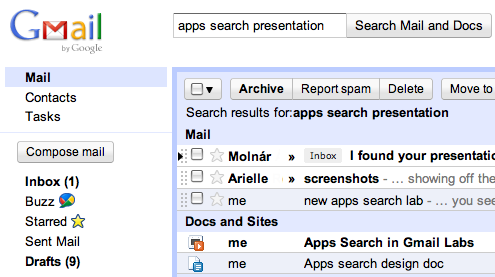 On Wednesday we cooked up our newest Labs feature in Gmail—a more powerful version of Gmail’s search feature. Now, not only can you search for messages and chats, you can also search for information in Google Docs and Google Sites from your inbox. This is a big time-saver when you don’t remember where the information you’re looking for is saved. 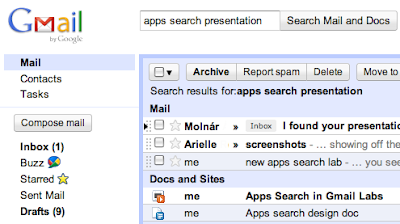 We also recently added the ability to drag attachments from Gmail to your desktop if you use Google Chrome. Life is now easier for people with multiple Gmail accounts. With the new multiple sign-in feature, you can toggle back and forth between accounts, or even have Gmail open in two tabs with different accounts. To learn more about this feature for advanced users, head over to the Gmail Blog. 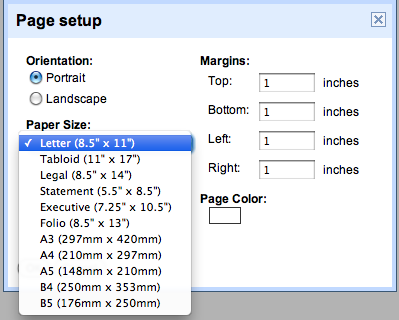 We rolled out a rapid-fire string of useful features for Google Docs over the last couple weeks, including alternate page sizes and resizable tables in documents, spell checking in spreadsheets, and a new curve rendering tool in drawings. All these features make creating and collaborating with others in real-time on documents, spreadsheets and drawings easier. Google Sites got in on the action this week too, with the ability to add horizontal navigation buttons, tabs or links to your sites. We also added the option to include a site-wide footer on your pages, and made it easier for people to open embedded documents in a new tab where users with access can make edits. For organizations, a key advantage of Google Apps is immediate access to productivity-enhancing innovations from third-party software companies. This month, nine new applications were added to the Apps Marketplace. Instead of struggling with patches and updates each month, Google Apps customers can activate new functionality with just a couple clicks. We have a long list of new customers to share who have recently switched to Google Apps. A warm welcome goes out to Roberto Cavalli, HÔM Real Estate Group, Luna & Larry’s Coconut Bliss, Bergelectric, the cities of Westerville and Wooster in Ohio, as well as the State of Maryland, which will be making Google Apps available to all 1.4 million of its K-12 and higher education students. If your business or school is ready to “go Google”, we’re happy to report that making the switch is even easier with new data migration options. In addition to our existing tools to migrate email, contacts and calendar data from Microsoft Exchange, hosted Exchange and Lotus Notes, last week we simplified the process to migrate from IMAP systems and PST data files. I hope these updates help you or your organization get even more from Google Apps. For details and the latest news in this area, check out the Google Apps Blog.